Why did Modi visit Meghaninagar next to Gulbarg Society before going to Godhra? Arguments in the Zakia Jafri Protest Petition against Narendra Modi and 59 Others continued for the fifth day on July 4, 2013 with counsel for Smt Jafri , Adv.Mihir Desai highlighting the deliberate lacunae by the Special Investigating Team in probing the illegal post mortems that were held in wide public view at the Godhra railway yard as part of the high-level Conspiracy masterminded by A-1 Narendra Modi with the full connivance of A-2 then health minister Ashok Bhatt, now deceased, A-5 Gordhan Zadaphiya and others, with the active participation of A-21 Jaideep Patel and other VHP men who were deliberately galvanized to use the fact and sight of the tragically burnt corpses to build up and spill venom against innocent members of the Muslim minority. Between 1330 – 1530 hours on 27.2.2002 after the assembly proceedings, A-5 Zadaphiya leaves for Godhra. Accused No. 1 gets four calls from A-2 Ashok Bhatt on the mobile number of his PA, OP Singh, informing A-1 about the situation in Godhra. A-2 Mr. Ashok Bhatt (now deceased) had admitted that it was he who had instructed local doctors through the Civil Surgeon at Godhra for the post-mortem. A-2 Mr Ashok Bhatt who was in regular touch with A-1 Mr. Modi left for Godhra at 9.30 a.m. according to his statement to SIT and reached around 12-12.30 p.m. As the inquest was over, a decision is taken by A-2 taking instructions from A-1 to conduct post-mortems in the railway yard itself where the dead bodies are lying. Decision was taken to start hasty post-mortems (Phone call records). SP Raju Bhargava (A-46) is directly responsible along with DM Jayanti Ravi for allowing these post-mortems in public in violation of law and in violation of Curfew Orders. Admittedly, according to DM Ravi and SP Bhargava, by 11 a.m. latest curfew had been declared in Godhra town; yet large crowds of the VHP were allowed to assemble at the railway yard where the burned corpses had been lined up and view the post mortem that, shockingly took place in public. Photographs and videos of the bodies too were allowed freely in violation of strict provisions of the Gujarat Police Manual. – Public post-mortem and free use and distribution of photographs of the gory bodies was encouraged by A-1, A-2 an A-5 to inflame the anger of the funeralists, which could be converted into a violent communal reprisal against innocent sections of the minority. Phone Call records that are a part of the SIT investigation but were deliberately ignored by the SIT were also used today by counsel Desai for Smt Jafri and Citizens for Justice & Peace to show how A-1 directed the illegally conducted post mortems in full public view. Calls were made from the phone of his PA OP Singh who travelled with him to Godhra. Equally said Desai a mysterious and suspicious detour on the way to the airport could be detected from the locational details of Anil Mukhim and JP Thakkar from the Chief Minister’s Office (CMO) who also accompanied him to Godhra. On the way to the Ahmedabad airport from Gandhinagar the location of these two officials who admitted by Modi himself accompanied him to Godhra, are found in and around Meghaninagar where the Gulberg society is located and where one of the worst massacres occurred the next morning. Why did A-1 go here when this was not on the way to the airport and when Meghaninagar is not a communally sensitive area? Why did SIT record statements of all CMO men except AP Patel from who’s phone A-1 called Jaideep Patel on the morning of 27.2.2002 directing him to go to Godhra ?The Bandh call given by the Vishwa Hindu Parishad was known to officialdom by 12.30 p.m. openly supported by the ruling BJP and became an occasion to allow VHP-RSS mobs to roam the streets of Gujarat with impunity. The first ever message from the Home department headed by A-1 Modi to round up communal elements and act is given after 10 p.m. on 28.2.2002 when more than half of the pre-planned massacres have taken place. Desai gave copies of this message to the Judge from the SIT Papers ( Document attached).The calls made by Ashok Bhatt on the Mobile of Mr Om Prakash Singh has again not been discussed by the SIT The call details show that A-1 (chief minister) was in touch with A-21 MrJaideep Patel as well as with A-2 Ashok Bhatt. The making of calls by A-2 Ashok Bhatt to Accused No. 1 shows that the Inquest of dead bodies was done after taking instructions from A-1, the chief minister. The A-1 had used the mobile of Om Prakash Singh. In the statement given to the SIT by Singh (9.11.2009), he accepted that A-1 spoke on his mobile when there was an extreme emergency. He only says that he did not see A-1 talking to anyone on his mobile phone. The SIT’s conclusions that CM was not in touch with “controversial persons Maya Kodnani and MrJaideep Patel during riots” is contrary to the documents on record. A-1 was therefore in touch with both Maya Kodnani (A-16) and MrJaideep Patel (A-21). The mobile phone call records of Mr. Anil Mukim show that between 15:37:57 hours and 21:58:36 hours his location is not traceable which is in all likelihood during the time he was accompanying Accused No1 to Godhra. However, just before that, at 15:33:40 hrs his location (and then again at 22:01:18 hrs) is shown to be in and around Meghaninagar where the Gulberg Society is located and a major massacre was perpetrated the next day. Does this mean that Accused No. 1 went to the airport via Meghaninagar and if so, why? The SIT has not investigated this despite it being pointed out. Interestingly, the other person from the CMO who accompanied A-1 to Godhra, Mr. J.M. Thakkar PRO to the CM, also shows his location before going to Godhra in the same location, in and around Meghaninagar at 15:34:48 hrs. Mr. Zadaphiya A-5 has reached Godhra by around 1600 hours. After arrival at Godhra helipad, A-1 Modi directly goes to the site, which is the railway yard where the dead bodies after inquest were lying. He enters into the burnt coach and while coming out talks to the media. It is during this time that the postmortems on the dead bodies start. A-1 was therefore party to the decision to conduct postmortems (illegally in the open railway yard). When he talks to the press there are several VHP workers present. Mr Jaideep Patel (A-21), Ashok Bhatt (A-2) and Zadaphiya (A-5) were present when A-1 visited the railway yard which is where the mutilated and burnt corpses have been allowed to have been kept in the open. It is at that point of time that a decision was taken to hand over the dead bodies to Mr Jaideep Patel (A-21) of the VHP for being taken by road to Ahmedabad. When A-1 arrives at Godhra, he was received by Mrs. Jayanti Ravi and Mr. Ashok Bhatt and he straightaway drove to the Godhra Railway Station, inspected the spot and thereafter proceed to the Collectorate and meet people and the press. Two ministers from his cabinet, Co-accused No 5, Mr Gordhan Zadaphiya, then MOS Home and Accused No 4, Prabhatsinh Chauhan, the then Minister of Civil Aviation & Pilgrimage, were also present. It was the Collector who revealed to the investigating agency (SIT) that MrJaideep Patel and VHP Gujarat secretary (A-21) also met chief conspirator and Accused No.1, at Godhra. SIT admits at Page 60 in its final report dated 8.2.2012 that Mrs Jayanti Ravi has stated that in the meeting held at the Collectorate, A-21 Mr Jaideep Patel, a VHP leader was also present. However, under Allegation No. IV, the SIT still goes on to assert that A-1 Mr. Modi had never met A-21, Mr. Jaideep Patel (SIT Report, 8.2.2012). The SIT has not dealt with this aspect that the post-mortems of the dead bodies was taking place in the presence of A-1 and was not stopped by him though it was an illegal act. The SIT also does not deal with the presence of a large crowd of VHP workers and the presence of Mr Jaideep Patel general secretary of VHP Gujarat besides the presence of A-2 Mr Ashok Bhatt and A-5 Mr Zadaphiya. Worst of all, the SIT has not bothered to even look at the required legal procedures necessary to be observed in the wake of the Godhra tragedy. There are strict laws against allowing such hasty post-mortems to happen without proper procedures of identification and without family members being present; there is a strict prohibition against allowing photographs of corpses in a gory or mutilated condition from being taken, shot or telecast. (See details of Rules from the Gujarat Police Manual mentioned below). By not even dealing with this grave offence, the SIT has shown its unprofessionalism and distinct bias. SIT has deliberately left un-investigated the whole question of the illegal and hasty post-mortems conducted in the open in the rail yard, with large and aggressive crows of the VHP, RSS and BD present, despite the fact that these facts are made known to them in the statements of then DM Jayanti Ravi and others. SIT has not investigated how gory photographs were allowed to be taken, telecast and broadcast not just by newspapers like the Sandesh but also publications brought out by the VHP. SIT obviously did not consider investigating such serious facts as emerged in the Investigation that too in such a sensitive case. 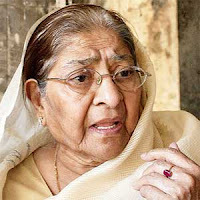 Arguments on behalf of Complainant Smt Zakia Jafri assisted by Citizens for Justice & Peace will continue on July 18. Attached is the List of Dates handed over to the Court today; Chart showing Locational details of Powerful Accused at Meghaninagar on the way to Godhra and the belated message sent after 10 p.m. on 28.2.2002 from the Home Department headed by A-1 Narendra Modi to ask for preventive detentions.